I'm Rosemary Hyslop, proprietor of Layhead Farm Cottages. My job consists of everything from greeting and welcoming visitors to the cottages, to cleaning and making beds in the cottages as well as arranging repairs, gardening and office work etc. 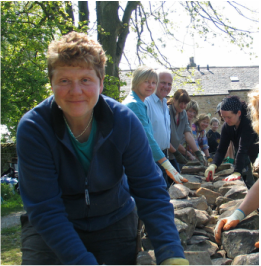 In the picture above you can see me dry stone walling! I came to be doing this job as a result of a decision about 23 years ago to partly diversify from farming. We therefore converted one large barn into 2 holiday cottages and the business started 21 years ago. I had no experience of tourism or hospitality so I am mainly self-taught. I enjoy meeting new people and welcoming visitors to the cottages, telling them about this wonderful area to make sure they have a great time here in the Yorkshire Dales. Our guests say we offer a fantastic and personal welcome and show great attention to detail. We try to ensure that's the case, and I try to be as accessible as possible, or if I'm not around I'll arrange for some one else to ensure there are no problems and everyone enjoys their time with us to the full. 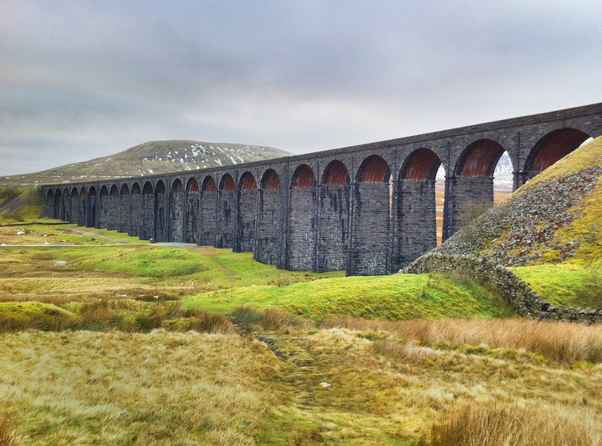 I think it's really worth going to see Ribblehead Viaduct in its stunning setting. You can't help but marvel at the imposing structure, its history, and how it was built without access to modern machinery. It's often a little windy over there so you're bound to be able to blow away the cobwebs! I like to meet and socialise with friends and family. Dales folk are so friendly and open, and we love to chatter and exchange stories. I like to go to the Talbot Arms in Settle as there's always a friendly welcome and they serve good beer and pub food. Outside at night, it's wonderful to stop for a moment and just listen to the owls calling (hooting), while out hunting in the surrounding fields. Probably any old farmer, who knows about the history of the land and farming practices in years gone by, and who believes that the Yorkshire Dales landscape should be preserved for generations to come.